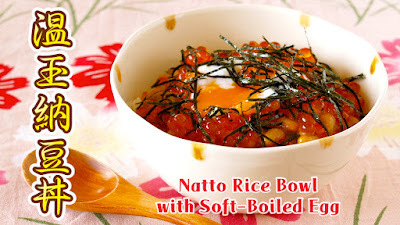 Soft-boiled egg makes the rice dish very mild and easy-to-eat!!! The soy sauce I used is "Matsuno Shoyu"! Matsuno Shoyu (in Kyoto) has practiced the traditional handmade method of making Japanese soy sauce for 200 years. Only the best ingredients are chosen because these decide the final aroma and taste of their soy sauce after fermentation in wooden barrels. 1. Mix Natto with the seasonings attached. If you mix the seasonings straight away, it won't develop the stickiness. I prefer to mix lightly for a few times. However, if you prefer gooey Natto, you want to mix Natto very well before adding the seasonings. 2. Pour Natto over the rice. Make a hole in the middle and place a soft-boiled egg. 3. Sprinkle with Ikura or soy sauce to season. 4. Sprinkle with Kizaminori to finish.